Born and raised on the prairies, David Bouchard was a West Vancouver school administrator when he first provided the poetic text for Roy Henry Vickers' The Elders Are Watching (Eagle Dancer), about a Native boy learning spiritual values from his grandfather, as well as the text for If You're Not From The Prairie, in collaboration with prairie artist Henry Ripplinger. He has since produced more than 20 titles, plus his collaborations with Cree artist Allen Sapp entitled Song of My Heart (Raincoast, 2002, $19.95) and Nokum Was My Teacher (Red Deer Prfess, 2006). 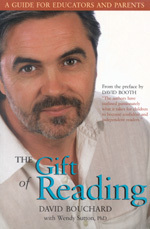 Having moved to Victoria, he was one of four co-authors of For the Love of Reading: Books to Build Lifelong Readers (Orca, 2004), co-author of the picture book Long Powwow Nights (Fitzhenry & Whiteside 2009) with Pam Aleekuk and illustrated by Leonard Paul and author of The Secret of Your Name (Red Deer Press, 2009), illustrated by Dennis Weber. David Bouchard and illustrator Zhong-Yang Huang have won this year's Red Cedar Award for Non-Fiction for The Great Race: The Legend of the Chinese Zodiac, a 1997 children's title from Raincoast. Decadence in power never fails to fascinate. The butcherous Laurent Kabila liked to bathe in Chanel No. 5 after he finally gained power in the Congo. The Borgia Pope held orgies in the Vatican. And the Empress Dowager didn't lift a finger to stop The Boxer Rebellion: I Ho Chuan, a secret society of righteous fists (translated as 'Boxers' by Americans) hacked people to death with swords and left their heads on village gates to rid China of foreign devils in 1900, but the Empress Dowager refused to outlaw such activities. As a 16-year-old named Orchid she had been taken to the Emperor's palace with 60 other concubines and received the inappropriate name Tz-u-his, meaning kindly and virtuous. After she bore a son, she pleaded with the ailing Emperor Hsien-feng to name her son Chih the next emperor. He became China's ruler at five in 1861. Tz-u-his ruled China through her son as the Dowager Empress, then maintained influence through intrigues and alleged murders. Dave Bouchard has fictionalized her remarkable story for Dragon of Heaven (Raincoast $39.95) illustrated with 25 oil paintings by Zhong-Yang Huang. In Prairie Born (Orca $16.95), Dave Bouchard teams up again with artist Peter Shostak, this time to explore the prairie experience in verse and image. It focuses on the passing of the seasons and their effect on the people and the landscape; hockey on a frozen pond, golden wheatfields beneath an enormous sky and long days of work under a blazing summer sun.